Marseille's Mario Balotelli (Left) celebrates his goal against Amiens with Lucas Ocampos. 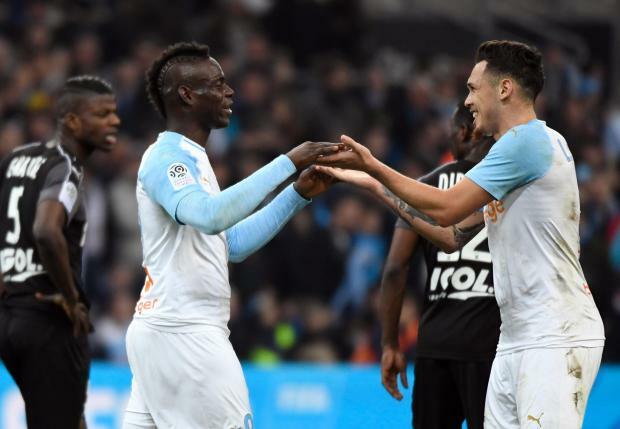 Mario Balotelli scored for the third time in four games for Marseille to seal a 2-0 victory over Amiens in Ligue 1 on Saturday. The Italian failed to find the net in 10 matches for Nice this season but has found his goalscoring touch since arriving at Marseille last month. Balotelli appeared to have grabbed a second midway through the second half when he nodded in from a free-kick, but the goal was ruled out for offside following a VAR review. Marseille have recorded three straight wins for the first time this season and jumped to fourth, six points behind Lyon in the final Champions League spot. Monaco will bid to pull clear of the relegation zone later at home to Nantes, while leaders Paris Saint-Germain go to fifth-placed Saint-Etienne on Sunday. Lyon overcame bottom side Guingamp 2-1 on Friday in their final outing before Tuesday's Champions League last 16 first leg at home to Barcelona.